At 318 pages, John Saul’s Comes the Blind Fury, is of quite a reasonable length, and is quite an interesting read. It is a little sad in places, a little mysterious in others, and spooky all the way through. The book’s prologue takes the reader back about a hundred years. A little blind girl called Amanda is walking near the top of some cliffs. Below her, the cruel sea and the even crueller rocks. Amanda knows her route well enough though, and is not unduly worried. In fact she is so confident of her route that her cane is rendered almost redundant. Then the other children come, bringing with them their nasty laughter and even nastier tricks. And, of course, Amanda’s death. Time has moved on by Chapter one and a new family, the Pendletons, are moving to Paradise Point. Cal Pendleton is a doctor and is coming to the Point to try and escape a bad memory – the death of a young patient. Leaving his life in Boston behind, he goes into practice with Dr Josiah Carson. The life of a doctor is a small practice is very different to that of a doctor in a large hospital and it is exactly what Cal feels that he needs right now. With him he brings his daughter Michelle and his pregnant wife June. Not only is Cal going to be working with Josiah Carson, but he has bought the doctor’s old house, a big Victorian-looking building. Michelle loves the house and picks her room immediately. She also finds an old porcelain doll in one of the cupboards and names it Amanda. June is a painter and decides that the house’s old potting shed will make a good studio for her to work in. She can hardly wait to get into it and get everything sorted out. One thing that definitely needs sorting out is the stain on the floor. The one that looks like blood. Michelle is the main character in Comes the Blind Fury and, when the reader is first introduced to her, she is the sort of girl that any parent would be glad to call their own. She is well adjusted and mature for her age. As the pages turn, though, people and circumstances—with a little ghostly intervention—cause changes in the young girl. Michelle isn’t the only one that seems to be changing since the move. Cal too, is in many ways not the man he used to be. 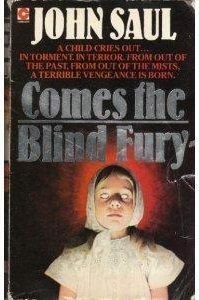 I enjoyed reading Comes the Blind Fury and would say that it is an ‘okay’ read. It’s not a book that I would label as brilliant though, and it is, perhaps, a little predictable in places. Still, if sun, sand and spooks are your cup of tea, then this book might well be worth a look.